This site circa 2010. Design created by Dear Hussain. Yesterday I wrote how you are an important part of my tribe. 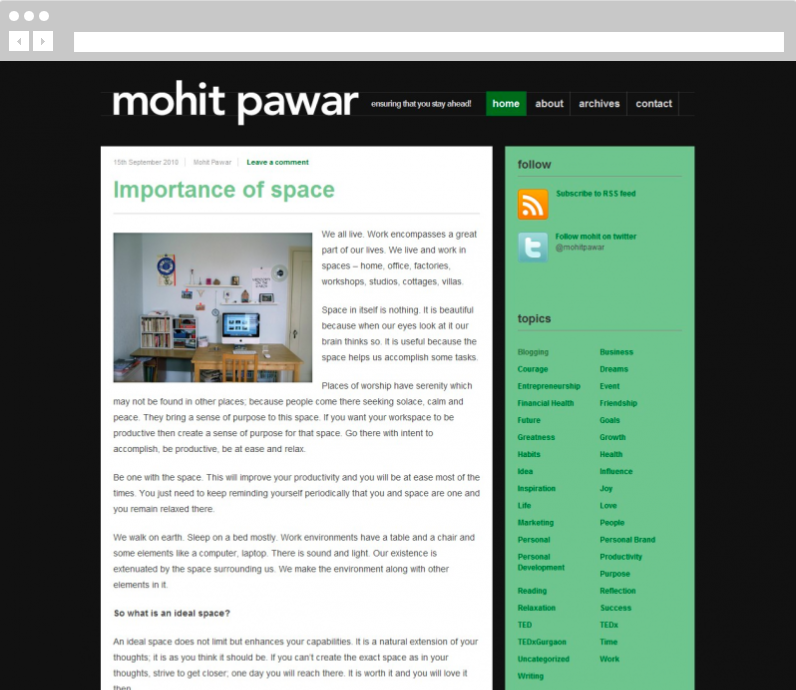 Today I am sharing how this site came to be and how it has grown since. I started this site as an experiment to document and share what I was learning. Over time one by one people came, joined and built the tribe, the community on this site. My friends were the earliest visitors to this site. Friends who I met through my interest in building tech communities. Some of them I met while I was building Bootstrap Hyderabad. We also hosted some of the earliest Barcamps including the first one in Mumbai at IIT Mumbai. I learned a lot about tech and startups through my interactions with these friends. We were an eclectic bunch, passionate and excited about how the world around us was shaping up. I am sure it also got some visibility through my work with global metblogs community which was big at that time. Around the same time, some close childhood friends found me. They with others close friends who I knew before landing in Hyderabad told their friends. And, more people started visiting. Then, search bots took note and people started finding my site in search engines. This resulted in people commenting on the site and it grew from there. Next wave was my collaboration with friends like Derek Sivers and James Altucher. I don’t think Derek and I would have written a book together if not for my writing here. An early traffic spike with a stream of new visitors came when James Altucher mentioned my site. It happened again when Derek sent out this tweet. It kept on building from there. More people came and the tribe became bigger. Through all this, I kept on writing here. I write here about startup growth, entrepreneurship, productivity, and personal growth. This is because these themes are close to my heart. At times I write about what is on my mind. But in most cases, I write to document, look back and to serve you. Hoping that you will find something useful and take action. I never made an effort to grow the site’s footprint except adding forms for you to add your email as a way to keep in touch. The community here also has grown on its own. The very first subscriber came in 2011 and when I checked last the number has gone up to around 5000. These days whenever I write something new here, subscribers receive an update. It is a makeshift version of keeping in touch. I’ll improve the way these emails land in your inbox and your experience when you see them on your devices. More on that another time. I plan to write more and share. Another important thing I want to do this year is to make a way for you to engage and be an active part of this tribe. How about we do more experiments? Those were fun. Like the parallel path experiment or when I invited you to join the No Metrics experiment. I have lots of ideas. At the same time, I am happy to hear your suggestions. For now, I have created an experiments page to list and run future experiments. This community is here because of You. And, I am keen to hear from you. 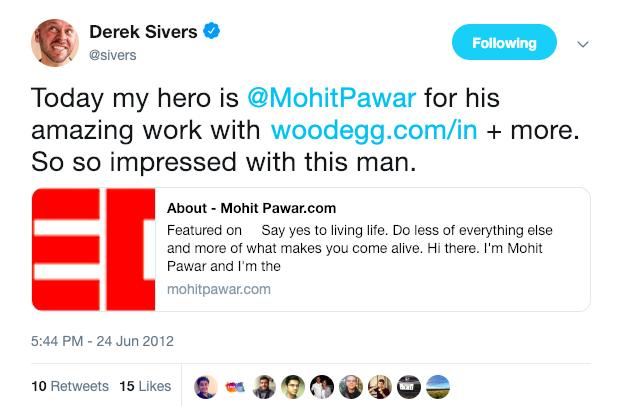 About your journey and your connection with me and/or mohitpawar.com? What did you like about the site then? Do you have favorite posts or themes? What is it that you like and what you’d like to change? Tell me in comments. I am all ears. Next post Are You Stressed? It Might Be Due To Your Relationship With Time.